A few weeks ago, one of my friends was telling me about a dry shampoo that was super inexpensive and worked like a charm. 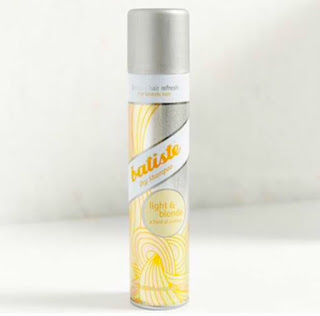 It's called Batiste and it's a tinted dry shampoo. This instantly seemed perfect because not all hair is the same and we all need a different type of dry shampoo. Let's chat about how her hair looked before and after... She showed us her hair when it was ready for a dry shampoo treatment and then went to it with batiste. I was floored. It seriously looked like she just walked out of the salon. Like I said, FLOORED!! They have 3 different tints of their dry shampoo. They have Light & Blonde, Medium & Brunette and Dark & Deep Brown. Batiste usually runs about $9 on Amazon.com with free shipping!! Here is a link for the Light & Blonde on Amazon! Oh, and did I mention it's the number one dry shampoo in the UK?? YEP! Can't wait for you to try it and fall in love with it as well! !